At SoGoSurvey, our main objective is to empower you to make better decisions using online surveys. We are pleased to announce our new feature — Rules & Alerts. What is Rules & Alerts? Rules & Alerts is a feature where participants get an automatic ‘Customized’ email when they respond to your survey. An unhappy response automatically triggers an alert that is sent to you, allowing you to take relevant action. Why use Rules & Alerts? For sending ‘Customized’ emails to acknowledge all those who have participated in your surveys. To receive instant notifications about any responses, either positive or negative, provided by your survey participants. To set up all kinds of automatic actions with just a few clicks. a) Go to ‘Design a Survey’ Tab. c) Click on ‘Rules & Alerts’ tab. a) Click on ‘New’ tab. a) Define the criteria for the rules by selecting any one of the Triggering Events mentioned below. i) Completed Survey Response Received – This rule will be triggered when the participant has completed the survey. ii) Partial Survey Response Received – This rule will be triggered when the participant has partially completed the survey. iii) Survey Response Meets the Condition – This rule will be triggered only when a desired response has been received for a particular question. iv)Total Number of Response Threshold is Met – This rule will be triggered when a particular number of responses have been received. 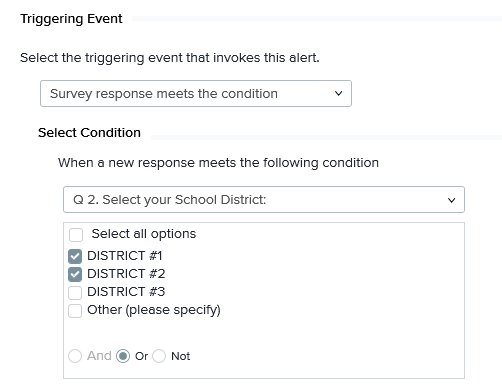 a) After selecting the Triggering Event, (i) Completed Survey Response Received & (ii) Partial Survey Response Received and clicking on Next, you need to select any one of the email recipients and define the workflow action. 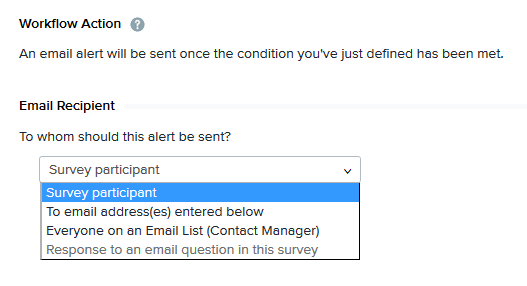 b) For criteria (iii) Survey Response Meets the Condition, you need to set the condition and then click on Next, after which you select any one of the email recipients and define the workflow action. 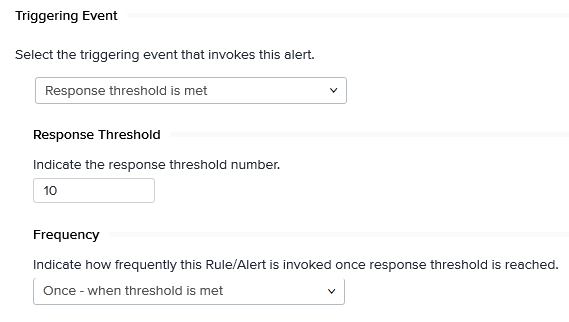 c) For criteria (iv) Total Number of Response Threshold is Met, you need to define the Total Response Threshold & Frequency and then click on Next, after which you select any one of the email recipients and define the workflow action. Note: For different email recipients, the workflow action will be different. Once the workflow action is defined, you need to define when the action will take place. Then click on ‘Done’ and the Rules & Alerts feature is set.